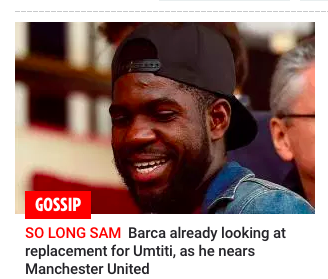 News that France international centre-half Samuel Umtiti has agreed a new five-year contract with Barcelona should disappoint tabloid-reading Manchester United fans. Umtiti, who joined Lyon for €25m in 2016, will remain at the club until 2023. 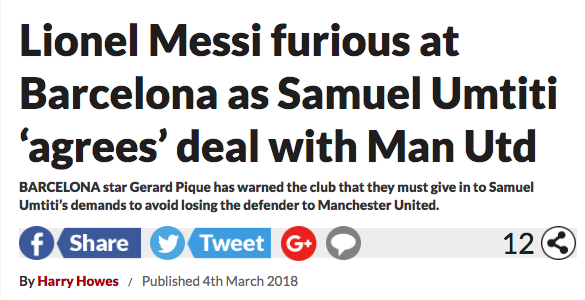 But on March 4 2008, the Daily Star told readers: “Lionel Messi furious at Barcelona as Samuel Umtiti agrees deal with Man Utd.” The source for the Star’s total balls was Spanish website Diario Gol. Of it, the Star says in a story published on March 4 and headlined “Man Utd News: Messi ‘chooses’ Umtiti replacement”: “Diario Gol often make sensational transfer claims.” Many of them are repeated verbatim in the Star. Umtiti, who has been heavily linked with a £53million move to United in recent weeks, appeared to double Barca’s lead in the 55th minute. However, replays showed it was another own goal from Roma..
“Sorry United?” Sorry, Metro readers, more like.